The Holocaust was a horrible display of the evil things people are capable of. Jews were transported from all over Europe to concentration camps, including thousands from Rotterdam. Among them were a significant number of children. 686 children to be precise, ranging from only a few months to 12 years old. Most of them didn’t survive the war. 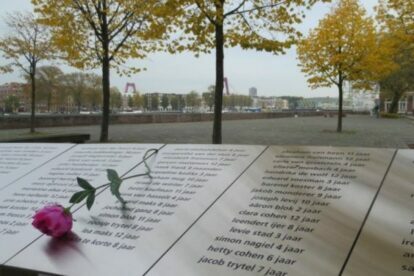 To commemorate these children, the city build a monument on the Kop van Zuid: the Joods Kindermonument (Jewish Child Monument). It is located between the two most important bridges of the city: The Willemsbrug (the red one) and the Erasmusbrug (the white one). When you walk from one bridge to another via the southside of the city, you’ll pass this monument by. It consists of an artwork with all the names of the children and a wall, commemorating the place from which the children were transported. It isn’t a fun or a happy place. Still, when I’m passing the monument I take a few moments to think about the victims and hope something like that doesn’t happen again. May they never be forgotten.